For a second year running Simon Bowler picked up a Gold Award for their garden design and build at Harrogate Flower Show. The vast majority of our works are bespoke but to give you an idea of our typical prices for our designs please use this as a rough guide. 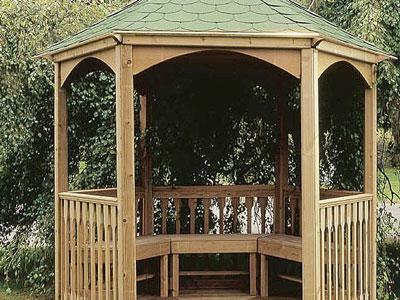 Based in Harrogate, Yorkshire one of our specialities is the bespoke design and construction of exceptional wooden Gazebos. We were pleased to have been chosen to design and install a new Softwood Gazebo to a private residence in Wetherby, North Yorkshire. The design brief given to use by the clients was to design and build an open sided gazebo in keeping in style and construction with an existing Oak Frame extension at the main house. 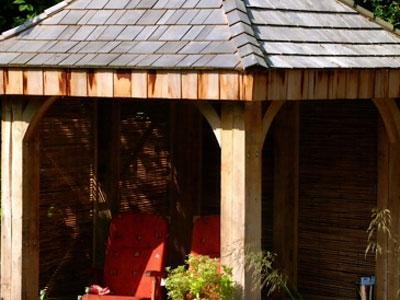 Our most popular bespoke wooden projects are Gazebos and we design and install extensively throughout Yorkshire and surrounding areas. Our clients determined a truly beautiful and simple brief for their Gazebo to be located in the corner of their recently landscaped garden. They required a simple design using top quality materials in order to provide a place to relax and appreciate their surroundings. Almost certainly we are Yorkshire’s premier wooden decking design and construction company, offering traditional or bespoke schemes. Principally wooden decking falls into 3 categories, detailed below. Increasingly popular, particularly in Yorkshire, are Landscape Sleeper Projects. Sleepers come in many different guises. When using reclaimed sleepers for raised beds for flowers or vegetables we only use the best grade, untreated hardwood sleepers. Based in Harrogate all our wood framed bespoke Pergolas are all individually designed and installed throughout Yorkshire.